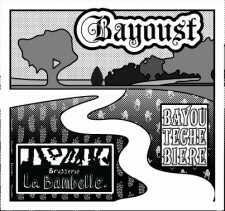 Arnaudville, LA – Bayou Teche Brewing is releasing their first collaboration beer, Bayoust. Collaboration beers are currently very popular in the craft beer industry – they are special edition, limited release beers that are crafted by breweries working in partnership. This Cajun brewery’s first collaboration beer is appropriately with a brewery located in their ancestral homeland, France. The beer is named Bayoust, and was brewed collaboratively with the Brasserie La Bambelle located in the cultural region of Brittany France – in the small town of St. Gravé. Bayou Teche Brewing’s Gar Hatcher, along with Louis Michot as a translator coordinated the recipe with the French brewers on Skype. The Brewer at La Bambelle, Gwennolé Legalloudec had worked out a basic recipe using grains native to each country. Buckwheat grows near the brewery in France, while corn is a native plant to the US, and the American brewers helped tweak the recipe to allow for Louisiana tastes. Brasserie La Bambelle is a true farmhouse brewery. Located on a family farm in Brittany, the brewers grow much of their own gains and hops for their beers and malt much of their own grain. The brewers at Brasserie La Bambelle’s goal are to one day make their own beer with their ingredients they have harvested themselves. Their aim is to one day be totally self-sufficient and autonomous on their farmhouse brewery. The brewery’s current beers are La Chervad, a blonde ale, La Filaj, a red beer, and La Camber, a black ale. The beer was called Bayoust to reflect the importance of the Bayou Teche, which runs behind the Arnaudville brewery, and the River Oust, which flows near the Brasserie La Bambelle. The artwork on the label was created by Byron and Cory Knott of Bayou Teche Brewing. They sought to create a medieval woodcut quality to the label, keeping it similar to the labels of La Bambelle’s. The duo thought the style was also appropriate for a beer that had originations in Europe. The label is of a landscape divided by a waterway – on one side of the water buckwheat is growing for France, on the other corn for Louisiana. The water way is actually a outlining of the Bayou Teche monument in Breaux Bridge and alludes to the Atlantic Ocean that separates Acadiana from France. French brewer Gwennolé says that the buckwheat lends a very earthy and cereal taste to the beer, which he describes as very appropriate for a beer with rural origins. The initial batch of Bayoust will be released in France, at La Bouge d’Or Festival in Redon. The festival is October 24th thru 27th and a delegation from Arnaudville will be going. The Arnaudville delegation has been working with the Articulteurs program that began in Brittany France. Together they are working to implement the French program in the brewery’s hometown of Arnaudville. Les Articulteurs is strategy which places culture at the heart of local development. The original plan was established in the town of Redon et Vilaine, around an innovative concept combining culture, economy and social cohesion – what the creators suggest is a cultural -territory venture. The delegation from Arnaudville will be there all week to celebrate and also to finish the work started earlier this year with Les Articulteurs in implementing the plan in their hometown of Arnaudville. The group includes local artists, musicians, businessmen and other interested individuals. While there the delegation play Cajun French music, help in the creation of art in the French community, and will attend La Bouge d’Or Festival and help in the release in the collaboratively brewed beer. 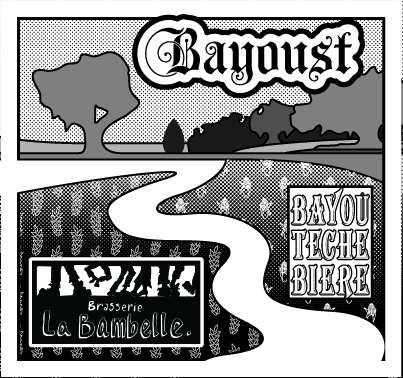 The Bayou Teche Brewing American release of Bayoust will not be until April. The Arnaudville Brewery will brew an identical batch of the one brewed at La Bambelle, package it with labeling and packaging legal for the United States. Said Louis, “We plan to release it in time for all of the spring festivals in Louisiana during April.” Louis says that this beer celebrates the centuries of cultural and historic collaborations, and also new and old friendships from across the Francophone world. Would like to know about the “When approached …” for collaboration. What is the back story on this? How do these things unfold?